The Ironman roadshow is in town. AS RECENTLY AS May, the European Sport Tourism Summit heard of Ireland’s potential to become a leading player in staging global sporting events and this weekend will provide more evidence of that. Athletes from all over the world have been arriving in Dublin in preparation for Sunday’s Ironman triathlon and it’s an event which organisers hope will enhance the reputation of Ireland as a sporting destination. The staging of the Giro D’Italia, and more recently the ICC World Twenty20 Qualifying tournament, have demonstrated Ireland’s capacity to play host to large scale events but they’ve been all too infrequent. Tourism experts say Ireland has underachieved in a burgeoning industry worth as much as €450 billion globally and currently sits 60th in a list of countries ranked by their ability to attract major competitions. But with the Women’s Rugby World Cup coming to these shores in 2017 and now the arrival of the Ironman series to the capital, Ireland is fast becoming an appealing location for organisers. As many as 40 countries will be represented on the start line on Sunday morning when participants – 1,500 of which will be Irish – prepare to tackle a gruelling course. The 70.3 mile edition of the now world renowned Ironman race involves a 1.2 mile swim in Dún Laoghaire bay, a 56 mile bike ride through the city and out into Maynooth and then a half-marathon culminating in the Phoenix Park. For the uninitiated, Ironman is an extreme version of triathlon and has become one of the fastest growing mainstream sports in the world. This weekend’s version is half an Ironman. It was once the activity of the super-fit and adrenaline junkies but the sport is now riding on the wave of enthusiasm in an age of healthy living and a booming modern fitness industry. The swelling interest levels are reflected in the number of first time athletes (half of the field) competing in Ironman 70.3 Dublin while 19% of entrants are female. Moreover, the entry list was full after five hours of online registration. “Ironman started in Hawaii in 1978 with John Collins who decided to combine the three toughest disciplines – swim, bike and run – to find out who was the fittest athlete and that created the challenge,” Stewart continued. Now over 200,000 people compete in an Ironman race every year. Twelve months ago, it was announced the world famous endurance race would be coming to Ireland but the planning for Sunday had started long before that. The nature of the event makes the planning process a logistical challenge for all involved. Dublin City Council played a significant role in bringing Ironman to the capital and the surrounding counties and have been heavily involved in every stage of the operation. Just like any marathon or triathlon, there will be a number of road closures in place throughout the day in order to accommodate the athletes and the large crowds expected to come out and watch. “In terms of organising these events, you’ve got those basic logistics that you’re trying to tie together a swim, cycle ride and then a run,” Stewart adds. “Finding good locations for all three is a challenge. With races in over two dozen cities around the world, the significance of Ironman coming to Dublin cannot be understated. The large number of international participants reflects that and the value these events bring to the local economy is immeasurable. “In terms of economic input, we estimate it will be worth around €3-4 million to the area,” Stewart explains. “Although the number of international athletes means that should boost the figure. It’s another opportunity for Ireland to show off to a worldwide audience and further test the infrastructure in and around Dublin and its suburbs. The starting gun will sound at 6.50am in Scotman’s Bay, Dún Laoghaire where the race will then move through the gears, quite literally, along the coast with the leading athletes expected to cross the finish line in the Phoenix Park around the four hour mark. But this isn’t just an event for the professionals. “People of all athletic ability will be taking part and it’s going to be a great spectacle. In terms of time, there’s going to be a huge difference between the leading parts of the field and those at the bottom but everyone’s got that same goal - to cross that finish line. “We have the field now we just need to ensure people come out and support the athletes throughout their long day. One of the main things people find about the race is they’re surprised what a spectacle it is,” Stewart said. Like the thousands who will line the streets on Sunday, Stewart hopes to have the chance to enjoy the world class sport with the iconic route in and out of Dublin acting as a truly spectacular backdrop. “When we started the planning process for this, we envisaged Dublin delivering a global event of the highest quality. We jumped at the opportunity to come to Ireland and from our point of view, Sunday will be very special. “Our goal for every race we put on is to see lots of very happy faces at the finish line and help athletes achieve their goal of completing an Ironman. 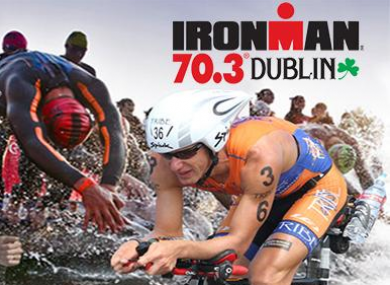 Ironman 70.3 Dublin starts at 6.50am on Sunday morning. More information on the route, road closures and the race itself can be found here. Email “'It will be special' - the biggest endurance race in the world is in Dublin this weekend”. Feedback on “'It will be special' - the biggest endurance race in the world is in Dublin this weekend”.